Today's news report from Auto News confirms it will be about X7. The SAV will be out in 2017 and will draw significant technology from the G11 7-series. Configurable rows for comfortable seating. The long-rumored BMW X7 will be built at the company’s plant in Spartanburg, S.C., a person familiar with the plans said. The German automaker will make the announcement on March 28, said the person, who was not authorized to discuss the move publicly. The Wall Street Journal, citing sources, reported late Thursday that BMW will spend several hundred million dollars to expand the plant to build the seven-seat X7. Construction at the plant would boost production levels to 400,000 vehicles annually, the person told Automotive News. It is currently being expanded to build 350,000 a year. "The U.S. will stay a market with great potential for us,” CEO Norbert Reithofer told reporters in Munich. “This is why we are evaluating the possibility of increasing capacity in the U.S."
The company had previously said a “significant economic and product announcement” regarding Spartanburg would be made March 28, without providing details. Last edited by LeMansX5; 03-21-2014 at 10:11 PM. GREER, SC — BMW plans to expand its Greer manufacturing campus to build its biggest SUV yet, according to published reports. Both The Wall Street Journal and Handelsblatt, a German business newspaper, reported that the automaker will expand its only U.S. plant to build the X7, a larger model than the X5, its first SUV model and a big seller for almost 15 years. A site plan BMW filed with the Spartanburg County Planning and Development Department details plans to build a 675,000-square-foot body shop, BMW’s third on the campus, near the intersection of Interstate 85 and Brockman McClimon Road. The X7 reports come at a time when BMW has recently disclosed plans for a big expansion in Greer. Steve Wilson, a spokesman for BMW Manufacturing Co., declined to comment on whether the plans were related to what the company plans to announce next week. Kenn Sparks, spokesman for BMW of North America, wouldn’t comment on the X7 reports. Gov. Nikki Haley, after a speech at a Greenville Chamber lunch this week, said next week’s announcement at BMW’s Greer plant would be “fun,” but didn’t offer details. The X7 would allow BMW to compete with Mercedes-Benz’s GL-Class and the Cadillac Escalade for customers who want a large luxury SUV with three rows of seats. The Greer plant is nearing the completion of a $900 million expansion announced in 2012 that would increase annual production capacity to 350,000 vehicles per year. The next expansion, expected to be announced next Friday at BMW Manufacturing Co., would increase capacity to about 400,000 vehicles per year, both publications reported. The local plant is the home to most of BMW’s family of X vehicles and already produces the X3, X4, X5 and X6 models. Handelsblatt reported that production of the X7 goes hand-in-hand with BMW’s introduction of the i3 electric runabout that went on sale late last year. The newspaper said that BMW’s X models have been enormous profit makers but that their carbon footprint needed to be balanced with electric and hybrid vehicles to meet the European Union’s fleet fuel emissions target. The Wall Street Journal said that most of the X7s would be sold in the United States, with some being exported to China, the Middle East and Europe. BMW Manufacturing Co. has typically exported about 70 percent of its vehicles for years. Domestic dealers say they would welcome every bit of increase in production capacity at the Greer plant, as it would give them more vehicles to sell. Tommy Kuranoff, general manager of Century BMW of Greenville, said he can’t get enough of the third generation of the X5, which went into production in October. Sparks said the X5 has the biggest sales backlog of any vehicle BMW sells in the United States. Two German rivals of BMW in the luxury car market, Mercedes-Benz and Audi, have been expanding their manufacturing in North America. Mercedes recently added production capacity to its Vance, Ala. plant, where it builds M-Class SUVs, and made the factory its primary production facility for its top-selling C-Class sedan. Audi is currently building a new plant in Mexico. The companies are racing each other for the title of leading luxury car maker. Our member Palbay took this picture yesterday of X7 prototype...a SAV parked next to F85 X5M for comparison. As per him; The bagged car is much larger than the F85 X5M & X5. On Friday, BMW will outline plans to build the seven-seat crossover in Spartanburg, South Carolina, and expand annual capacity to 400,000 units, a person familiar with the plan has told Automotive News Europe sister publication Automotive News. BMW sales boss Ian Robertson told Automotive News Europe in January that Spartanburg already was on track to become the company's largest plant because of this year's addition of the X4 crossover, which is forecast to help boost the plant's volume to 350,000 units year. With the X7, the volume is expected to grow by another 50,000 units. The flexible, high-volume plant is the German automaker’s "center of competence" for crossover production, CEO Norbert Reithofer says. At the event held at the plant, Dr. Reithofer was joined by U.S. Secretary of Commerce, Penny Pritzker; South Carolina Governor, Nikki Haley; BMW Group Board member for Production, Harald Krüger; and President of BMW Manufacturing, Plant Spartanburg, Manfred Erlacher. Since production began 20 years ago, in 1994, the Spartanburg plant has produced over 2.6 million vehicles for BMW customers around the world. 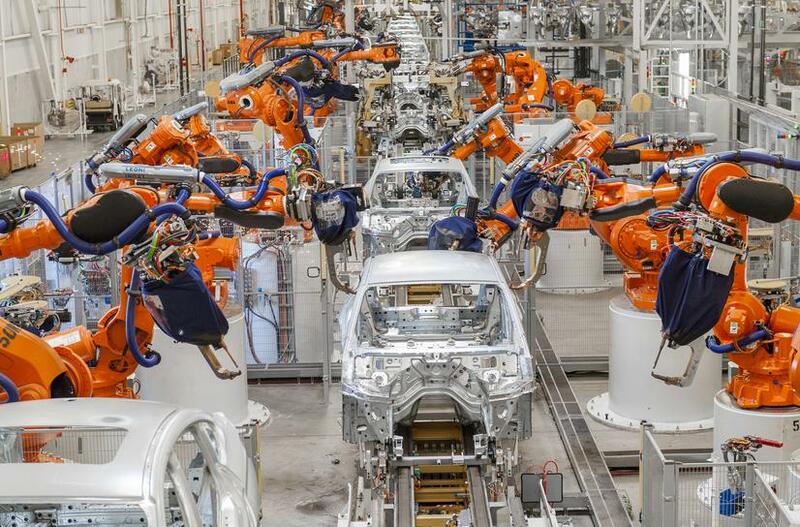 Currently the BMW X3, X5, X5 M, X6 and X6 M are all produced at the plant. The event also celebrated the start of production of the all-new BMW X4. In the near future, a plug-in hybrid version of the BMW X5 will also be produced here. In addition to its large-scale capital investments, a new study just released by the Moore School of Business at the University of South Carolina, reports that the BMW Group has a US$ 16.6 billion annual impact on the state economy. Its presence in South Carolina supports more than 30,000 jobs throughout the state. The study found that for every job created at the BMW plant, an additional three jobs are created elsewhere in South Carolina through the economic multiplier effect. In 2013, a total of 297,326 vehicles were manufactured in Spartanburg, with 1,100 vehicles currently produced per working day. Total employment at the site reached 8,000 in March 2014. Last edited by LeMansX5; 03-29-2014 at 07:37 PM. Well well well...look who's here... the X7! back in 2009, when I started this thread http://www.xoutpost.com/bmw-sav-foru...-about-x7.html people were skeptical. now after 5 years, the X lineup finally makes sense... or does it? let's see what happened: the early duo X3 X5, that were a success, left a gap for a large full size SUV, so BMW scaled up both of them to have the x3 a mid size suv (a little less than mid size) and the x5 a 7 seater (a tight cramped 7 seater) and intorduced the X1 to cover the small SUV... it took them year to realize that X3 and X5 became stretched to a territory that is not theirs! so the X7 will come to provide the full size 7 seater. The question now is this: didn't the X7 come late to the party? what will happen to the X3 and X5 who had a personality crisis during the last 7 years? will they be scaled down again, now that the 7 seater is here? personally, i hope so, i hope to see the x3 and x5 go back to the e53 and e83 sizes and the x1 will remain a compact crossover. I like it in red for some reason. What are we looking at here, $80k+? I wonder what the tow rating will be? Once you realize that this is the SUV equivalent of the 7-series, you will also realize that we will be "lucky" to see it start in the $80's (perhaps $89K without anything) and most decently equipped will likely be in the $90's or cresting the 6-figure mark. I don't think, or rather hope, they will start in the $80k's. They need to compete with others, e.g. Mercedes GL.